The Donjek Route is approximately 100-120 km in length, stretching from where the Duke River crosses the Alaska Highway, over the Burwash Uplands to the toe of the Donjek Glacier, then back to the Alaska Highway. Since this is a route, rather than a trail, there is no designated line on the landscape. For both ancient and modern travellers, the way taken can vary according to season, terrain difficulty, weather conditions, changes to creek and river levels, and the sightings of wildlife and other resources along the way. For a detailed description of the route, see Kluane National Park and Reserve of Canada: Donjek Route. The map below shows the approximate path of the Donjek Route. Each colour represents approximately one day of travel. The portion of the route to be included in the Alaska Highway Corridor Nomination is the section known as “Hoge Pass”. 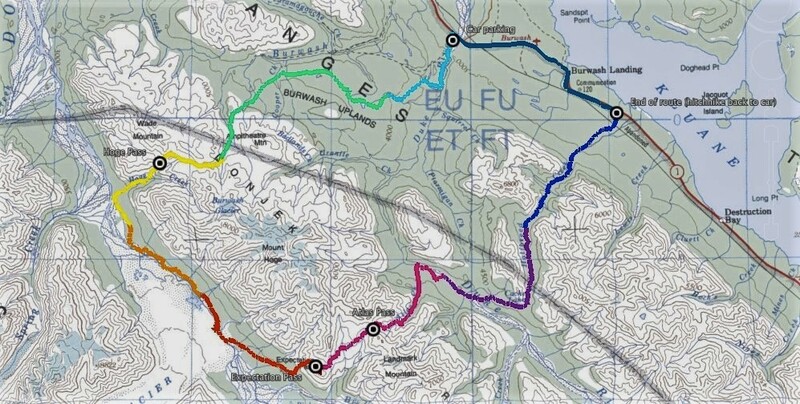 Located within Kluane National Park and Reserve, this section of the route stretches from near Burwash Creek, through Hoge Pass to Hoge Creek, and on to the Donjek River. Map Source: Online Blog, “Yukon Day 6 – Meeting Atlas and Beavers,” A Greenhorns Travelingtales: Stories note to be expected…, 8 August 2013, accessed May 2015. For thousands of years, Indigenous people have travelled, hunted, fished, and trapped in this area. This was part of their homeland, the land of their ancestors, and the repository of generations of stories, memories and traditional knowledge. This connection to the land was damaged as a result of Alaska Highway construction. The influx of thousands of soldiers and civilian contractors scarred the land: large forested areas were cleared, rocky bluffs dynamited to create a road bed, and animal populations were endangered by recreational overhunting. As a gesture of hospitality, the Canadian government had allowed US soldiers to purchase hunting licences for a nominal fee – thereby varying their diet and providing recreation. Local people were appalled by the soldiers’ lack of respect for animals and the land. This over-hunting and increased accessibility to outside hunters led to calls for protection. The Yukon Game Ordinance was amended in 1943 to create the Kluane Game Reserve with the Alaska Highway as its northern boundary. In 1972, this area was expanded with the creation of Kluane National Park and Reserve covering an area of 22,013 square kilometres (8,499 sq. mi.). First Nations people were no longer able to hunt except by special permit in times of hardship. This provision was tested in the early 1980s, when two First Nation men were arrested for hunting in the sanctuary. A court of appeal acquitted the two men in 1983, stating that the hunting prohibition did not apply to Indigenous people hunting for food. The right of Kluane First Nation citizens to resume traditional harvesting in the park was formally recognized as one of the provisions of the Kluane First Nation Final and Self-Government Agreements, which became effective in February 2004. More was needed, however, to repair relations with the governments who had alienated First Nations people from their homeland and to help new generations reconnect with ancestral lands. In the early 2000s, Parks Canada sponsored the “Healing Broken Connections” program, a $1.3 million multi-year program directed toward reconnecting “Kluane First Nation and Champagne and Aishihik First Nations Peoples to their traditional territory within the National Park and to understand how Traditional Knowledge can be accommodated in landscape scale decision making”. * This important step did much to address the impact of half a century of displacement from Tutchone homelands. * Walton, Mike, Paula Banks and Robin Bradasch. “Healing Broken Connections: Traditional Knowledge and Regional Integration Kluane National Park and Reserve.” Abstract of presentation at Mountain Communities Conference, Banff Centre, 2004. In 1979, World Heritage status was proclaimed for Kluane National Park and Reserve and Wrangell-St. Elias National Park and Preserve. This was expanded to become the largest international site recognized by UNESCO with the addition of Glacier Bay National Park and Preserve in 1992 and Tatshenshini-Alsek Park in 1994.